Research reveals that an average person checks his or her phone every six and a half minutes in a 16-hour waking cycle. Widespread overuse of mobile phones is resulting in a harmful condition known as Text Neck. Regular changes in posture has been shown to reduce stiffness, build strength, reduce severity and minimize recurrences of neck pain. It is important to hold your mobile phone at an appropriate height without straining your neck in order to prevent neck strain. Avoid holding phones between your ear and shoulder and this strains the neck muscles. It has been recorded that at an average a person sends or receives 50 text messages every day, which leads to 2.19 trillion messages in one year. And how does that affect your neck and back? Usage of mobile phoneby tilting your head can double or triple the weight of your head and can strain your neck. Over the years, over usage of cellphone can lead to early onset of arthritis and cervical spondylosis. Continuous usage of mobile phone in a slouched, head-bent position can also restrict your lungs’ ability to expand and can cause a breathing problems. 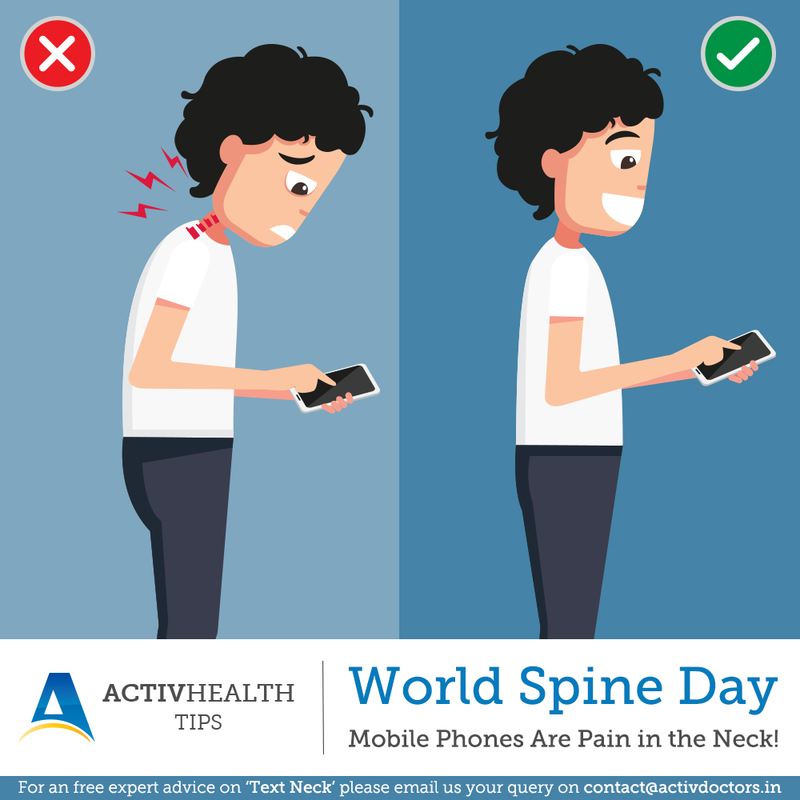 Over time, tilted head positions for activities like texting and reading on your mobile phone can contribute to increased risk of spinal wear and tear. Today mobile phones are an integral part of our lives. However, looking down by dropping your head forward can change the natural structure of your neck. Therefore, it is important to maintain good posture to avoid spine problems. You have to sit up straight and align the ears, shoulders and hips in one vertical line. So, how does good posture help you to avoid risk of serious spine disorders? Good Posture helps keep joints properly aligned to facilitate proper muscle function and decrease wear and tear. It reduces stress on the soft tissues surrounding the spinal cord which helps minimize the likelihood of injury. It helps muscles to work more efficiently, thereby allowing the body to utilize less energy and prevent muscle fatigue. It helps prevent muscle strain, overuse disorders, repetitive stress injuries and postural discomfort.